Hypertension is a common medical problem which affects almost all organs in the body. Among which, the brain is the major target organ for the adverse effects of untreated hypertension followed by the cardiovascular and renal system. It is a major risk factor for stroke and its related morbidity and also a powerful risk factor for cognitive decline, dementia, and Alzheimer’s disease. Perioperative hypertension is a common event in neurosurgical population due to the activation of sympathetic nervous system activity, renin-angiotensin-aldosterone activity, and interaction between the heart and brain which increases the perioperative morbidity and mortality. The presence of pre-existing hypertension is one of the major risk factors for the development of a postoperative hematoma after craniotomy. Congenital variation in the circle of Willis and vertebral artery leading to medullary ischemia is considered to be the cause for the development of essential hypertension. Pulsatile compression of vessels on the brain stem and cranial nerves can cause neurogenic hypertension. In this chapter, classification of hypertension and its causes, pathophysiology, the brain-heart interaction, preoperative evaluation, various causes of perioperative hypertension, and its management are discussed in detail. Brain Trauma Foundation. Guidelines for the management of severe TBI, 4th ed. 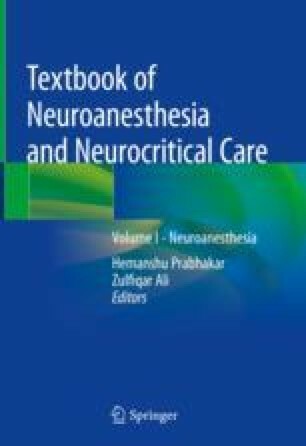 https://braintrauma.org/guidelines/guidelines-for-the-management-of-severe-tbi-4th-ed#/. Accessed 19 May 2018. Schonberger RB, Fontes ML, Selzer A. Anesthesia for adult patients with hypertension. UpToDate [Internet]. 2018. https://www.uptodate.com/contents/anesthesia-for-adult-patients-with-hypertension/print. Accessed 18 May 2018.